A seemingly simple question that most gardeners expect a simple answer to. I can give you the simple answer which, is a good place to start. There is a lot more to consider, but we will start simple. 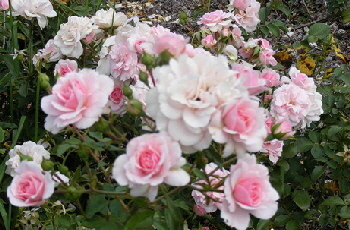 Hybrid Tea and Grandiflora roses should be planted 30” to 36” apart. Each plant will cover an area of about 6 to 10 square feet. Floribunda roses should be planted 24” to 30” apart. Each plant will cover an area of about 4 to 6 square feet. English roses should be planted 36” apart. Each plant will cover an area of about 10 square feet. Large shrub roses should be planted 30” to 36” apart. Each plant will cover an area of about 6 to 10 square feet. Small shrub roses should be planted 24” to 30” apart. Each plant will cover an area of about 4 to 6 square feet. Hedge roses should be planted 24” apart. Each plant will cover an area of about 4 square feet. Miniature roses should be planted 12” to 18” apart. Each plant will cover an area of about 1 to 2 square feet. Climbing roses should be planted 4 to 5 feet apart. Standard tree roses should be planted 3 to 5 feet apart. Patio tree roses should be planted 3 to 4 feet apart. Miniature tree roses should be planted 2 to 3 feet apart. Roses growing in ideal conditions will reach or exceed the mature size specified by the grower. These conditions include ideal sun, soil, water, nutrients, protection from wind and protection from cold. Less than ideal conditions can produce a smaller size rose plant. In growing zones 5 and north, roses do not get as large as they do in warmer climates. You need to adjust your spacing accordingly. Many of the Rugosa roses get very large and need some room to sprawl. The Canadian and Parkland roses are extra hardy and will often reach the specified mature size. Own root roses do not generally grow as large as when they are grafted to a vigorous rootstock. Shrub roses that are given plenty of room to grow, often spread wider than average. Shrub roses that are planted closer together will generally grow taller and not as wide. Shrub roses are available in hundreds of varieties and they are not all the same size by any means. When rose bushes are too crowded air circulation is reduced, inviting disease such as blackspot, mildew and fungus. Certain varieties are highly disease resistant and can be planted closer together. If your rose needs pruning you need well spaced plants to give you easy access. Certain varieties need little or no pruning, limiting the need to make your way through the thorny branches. What is your personal preference? What effect do you want to create? Do you plan to prune regularly to encourage compact full growth or to maintain size? See the article How Far Apart for a little more guidance on preference and effects. Decide on your preference and the affect you want to create. Check the conditions of the planting site, especially sun and soil. Determine the mature height and spread of the rose. 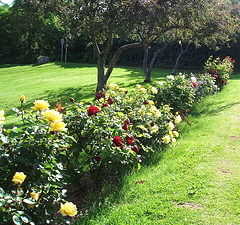 Ask for guidance from a trusted and respected nursery regarding the growth of the specific rose you are interested in. Err on the side of planting them too far apart. If you decide in a few years to move your roses, it is a lot easier to move them closer together than to struggle with thorny branches of closely planted roses. Enjoy your beautiful fragrant roses!